I am Italian and I live in London with my husband, our son and our beautiful basset fauve de bretagne. I love eating out and writing, Pastabites blog was born out of these two passions. It is purely my non professional opinion on things I eat, places I visit, food I cook. I am a Medievalist, I work in the financial industry and I love the Cure and Derren Brown. I also love dogs and I try to highlight when a venue I visit is dog friendly as I believe it is useful to other dog owners. I am hugely involved with various charities and very keen on sustainability particularly with regards to sea food and fish. Whatever I write… Opinions are my own! I would like to personally congratulate you as your blog Pastabites has been selected by our panelist as one of the Top 50 Italian Food Blogs on the web. I personally give you a high-five and want to thank you for your contribution to this world. 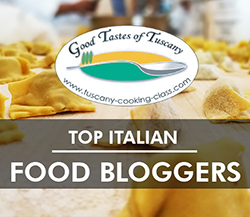 This is the most comprehensive list of Top 50 Italian Food Blogs on the internet and I’m honored to have you as part of this!